Peptide signaling controls many processes involving coordinated actions of multiple organs, such as hormone-mediated appetite regulation. However, the extent to which the mode of action of peptide signaling is conserved in different animals is largely unknown, because many peptides and receptors remain orphan and many undiscovered peptides still exist. Here, we identify two novel Caenorhabditis elegans neuropeptides, LURY-1-1 and LURY-1-2, as endogenous ligands for the neuropeptide receptor-22 (NPR-22). Both peptides derive from the same precursor that is orthologous to invertebrate luqin/arginine-tyrosine-NH2 (RYamide) proneuropeptides. LURY-1 peptides are secreted from two classes of pharyngeal neurons and control food-related processes: feeding, lifespan, egg-laying, and locomotory behavior. We propose that LURY-1 peptides transmit food signals to NPR-22 expressed in feeding pacemaker neurons and a serotonergic neuron. Our results identified a critical role for luqin-like RYamides in feeding-related processes and suggested that peptide-mediated negative feedback is important for satiety regulation in C. elegans. Deciphering the mechanisms of appetite control and the physiological effects of feeding is of great significance in modern societies, in which eating disorders and obesity are major health issues. The regulation of feeding requires interactions between distant organs and flexible fine-tuning of neural circuitries; therefore, it is no wonder that many neuromodulators including peptide hormones have been reported to control feeding in animals (Coll et al., 2007; Sobrino Crespo et al., 2014; Marder, 2012). Previous studies in mammals have suggested the importance of negative feedback mediated by peptide hormones in satiety signaling. For example, feeding induces the secretion of anorexigenic (feeding-inhibitory) hormones such as peptide YY (PYY), pancreatic polypeptide (PP), cholecystokinin (CCK), and glucagon like peptide-1 (GLP-1) from the digestive organs, which in turn prevent excessive feeding (Perry and Wang, 2012). These peptides counteract or negatively regulate neuropeptide Y (NPY), which is orexigenic (feeding-stimulatory). Although a wealth of knowledge has been obtained in mammalian models for food-related function of these peptides, understanding the roles of each peptide is not straightforward because of the multitude of cells and tissues involved and the multiplicate regulations acting on the peptides. Extensive studies have also been conducted on feeding and gastric motor circuits in invertebrates. For example, in Aplysia, the buccal ganglion feeding circuit is known to be regulated by neuropeptides such as Aplysia NPY, allatotropin-related peptide (ATRP), and myomodulin gene 2-derived peptide (MMG2-DP), while the feeding-related circuits in the stomatogastric ganglion in crustaceans are also regulated by known neuropeptides, as well as classical neurotransmitters (Marder, 2012; Taghert and Nitabach, 2012). It is however still unclear to what extent these regulatory logics are universal and commonly inherited in the animal kingdom. The nematode Caenorhabditis elegans exhibits a variety of food-related behavioral and physiological plasticity despite its simple body structure (Ashrafi, 2007; Avery and You, 2012; Hart, 2006). C. elegans feeds on bacteria and ingests them by a pumping and peristaltic movements of the pharynx (or foregut) (Avery and You, 2012). The pumping rate of the pharynx is finely regulated by food availability and other environmental conditions, while food availability also affects other behaviors such as egg-laying and locomotion (Avery and You, 2012; Waggoner et al., 2000; You et al., 2008). For example, when starved C. elegans worms abruptly encounter food, pharyngeal pumping and egg-laying become highly active (Dong et al., 2000; You et al., 2008). Such enhanced food intake during the refeeding period then induces a cessation of feeding and locomotion, which is thought to result from satiety (You et al., 2008). This detailed knowledge of food-related behaviors, along with the small number of cells and the simplicity of body structure, makes C. elegans a useful model system to investigate the evolutionarily conserved regulatory mechanisms of feeding and satiety. Monoamine neurotransmitters and some of the arginine-phenylalanine-NH2 (RFamide) neuropeptides are known to be involved in food-related regulations and in some cases the exact cells in which these signaling molecules act have been identified (Chase and Koelle, 2007; Cohen et al., 2009; Li and Kim, 2008; Papaioannou et al., 2005; Waggoner et al., 2000). Previous studies suggest that peptidergic signaling often acts as a component of a feedback loop and fine-tunes food-related neuronal circuits (Chalasani et al., 2010; Cohen et al., 2009). Understanding the mechanisms of feeding control in nematodes such as C. elegans is also industrially important, because feeding is vital and can be a promising target process for pest control. For example, ivermectin, which is one of the most successful drugs both in human and livestock medicine (Omura and Crump, 2004), has been considered to exert its nematocidal effects on C. elegans through the constitutive opening of AVR-14/AVR-15-containing glutamate-gated chloride channels, and thus prevents feeding (Keane and Avery, 2003). Our current understanding of feeding control by peptide signaling in animals is still largely limited, because (1) many peptides and peptide receptors are still orphan (i.e. for which a binding partner(s) has yet to be identified), (2) feeding is a very complicated process that involves most organs in the body, (3) the relative genetic intractability of the mammalian system makes it difficult to determine the in vivo functions of peptides and their receptors, and (4) the search for novel peptides and comparative analyses of peptides across classes or species have been hindered by their small size and low sequence conservation. The mammalian NPY peptide family, which is composed of NPY, PYY, and PP, is characterized by sequence features such as the C-terminal arginine-tyrosine-NH2 (RYamide) motif and their involvement in appetite control (Loh et al., 2015; Tatemoto, 1982). Five receptors for the NPY peptide family have been cloned from mammals (Y1, Y2, Y4, Y5, and Y6). These receptors belong to the superfamily of seven-transmembrane G protein-coupled receptors (GPCR). NPY family peptides perform a variety of physiological functions by activating different subtype receptors (Loh et al., 2015). In invertebrates, peptides containing the C-terminal RYamide structure were first discovered in the brachyuran crab Cancer borealis (Li et al., 2003) and are also found in diverse classes, such as crustaceans (Christie, 2014; Dircksen et al., 2011; Ma et al., 2010), mollusks (Proekt et al., 2005; Veenstra, 2010), and insects (Hauser et al., 2010; Ida et al., 2011; Roller et al., 2016). Some RYamide-containing peptides have been previously implied to have a role in feeding; the abundance of FVGGSRYamide and SGFYANRYamide increases after food intake in Cancer borealis (Chen et al., 2010), QPPLPRYamide (MMG2-DPb) modulates contractions of a feeding-related muscle in Aplysia californica (Proekt et al., 2005), and the gene encoding EERTDMSPVPFVMGSRYamide and SPARLITPRNDRFFMGSRYamide is expressed in the enteroendocrine cells of the midgut in Bombyx mori (Roller et al., 2016). Luqins, a family of peptides originally isolated from left upper quadrant (LUQ) neurons in Aplysia, are peptides with around 10 amino acids with C-terminal RFamide, RYamide, or RWamide, and also characterized by a motif containing two cysteines located in the C-terminal portion of their precursors (Jékely, 2013; Mirabeau and Joly, 2013; Semmens et al., 2016; Zatylny-Gaudin and Favrel, 2014). Some members of precursors that encode a RYamide-containing peptide(s) in ecdysozoa are considered to be closely orthologous to lophotrochozoan luqin precursors, and this family of ecdysozoan peptides has been historically called RYamides (Jékely, 2013; Mirabeau and Joly, 2013). Orthologs of luqin/RYamides precursors have been also found in deuterostomes (S. purpuratus and S. kowalevskii), but not in chordates (Jékely, 2013; Mirabeau and Joly, 2013). Using nucleic acid-based homology screening approaches, a Drosophila melanogaster GPCR, CG5811 (also known as NepYR), was identified and found to be activated by mammalian NPY and PYY (Li et al., 1992). Endogenous ligands for CG5811 had long been unknown. Recently, we identified two RYamide-containing peptides in Drosophila melanogaster, named dRYamide-1 and -2 (Ida et al., 2011), as potent endogenous ligands for CG5811 (Collin et al., 2011; Ida et al., 2011) (Figure 2C). dRYamides modulate feeding behavior in the blowfly Phormia regina (Ida et al., 2011; Maeda et al., 2015). However, little is known about the precise physiological roles for dRYamides and CG5811 in regulation of feeding and other behaviors. In C. elegans, FMRFamide-like peptide-7 (FLP-7) derived peptides were reported to be ligands for neuropeptide receptor-22 (NPR-22), which is phylogenetically similar to CG5811 (www.wormbase.org; Figure 1—figure supplement 1; Mertens et al., 2006; Palamiuc et al., 2017). This phylogenic analysis shows that NPR-22 and CG5811 belong to the luqin/RYamide receptor family and may be distantly related to tachykinin, NPY, and leucokinin receptors (Figure 1—figure supplement 1), although the evolutionary relationship between the luqin/RYamide receptor group and other receptor groups has not so far been clear (Jékely, 2013; Mirabeau and Joly, 2013). FLP-7 precursor does not have characteristics of luqins, such as a canonical pair of cysteines in the C-terminal portion, and all of the peptides generated contain C-terminal RFamide structures, but not RYamide structures. Therefore, it is still largely elusive how the repertoire and the mode of action of luqins and RYamides are conserved in C. elegans. Here, we report the identification of two luqin-like RYamide peptides in C. elegans, named LURY-1-1 and -2, as endogenous ligands for NPR-22. 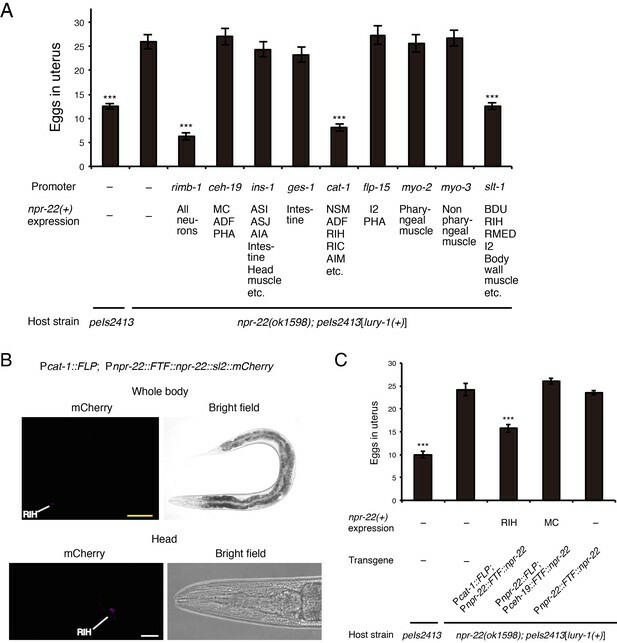 Importantly, LURY-1 peptides are secreted from two classes of pharyngeal neurons in a food-dependent manner and regulate multiple food-related processes including feeding and egg-laying through NPR-22. LURY-1 peptides act on the feeding pacemaker neurons MC and the serotonergic RIH neuron to exert their functions. Our results propose that luqin-like RYamide peptides are important for satiety transmission. To identify novel peptide ligands in C. elegans, we constructed a stable CHO cell line expressing NPR-22a (CHO-NPR-22a) and measured changes in intracellular calcium concentration ([Ca2+]i) induced by gel filtration samples from worm extracts. However, we could not detect any agonist activity from each fraction in this Ca2+ assay (Figure 1A). In contrast to the NPR-22a-expressing cells, our previous study showed that CG5811-expressing cells have a distinctive feature to detect both RYamide- and RFamide-containing peptides with high potency (Ida et al., 2011). Therefore, we utilized a stable CHO cell line expressing CG5811 (CHO-CG5811) to search for agonist peptides from C. elegans extracts. The agonist activity for CHO-CG5811 cells was revealed at molecular mass (Mr) of about 1000 by gel filtration chromatography (Figure 1A). This activity could not be detected on CHO-NPR-22a cells even by the use of ten times the amount of samples used on CHO-CG5811 cells (Figure 1A). When the active fractions were separated by carboxymethyl ion-exchange high-performance liquid chromatography (CM-HPLC) at pH 6.5, four distinct agonist activities were revealed (fractions A–D, Figure 1B). Each activity was purified as a single peak by successive reverse-phase HPLC (RP-HPLC). Of these, two peaks, P1 and P2, were isolated from fraction A (Figure 1—figure supplement 2A,B). Amino acid sequences of the purified peptides were determined by a protein sequencer and mass spectrometry (Table 1). These two peptides were encoded by the same gene, Y75B8A.11, which was predicted as an ortholog of luqin/RYamide precursors in a bioinformatic study (Mirabeau and Joly, 2013). Combined with the sequence of the Y75B8A.11 cDNA (Figure 2A,B), we deduced the primary structures of the peptides as AVLPRY-NH2 (P1) and PALLSRY-NH2 (P2) (Figure 2C). Mass spectrometric analysis revealed that the observed monoisotopic m/z values of the purified peptides (P1, 717.25 and P2, 818.34) were almost identical to the theoretically predicted values (717.42 and 818.46, respectively) for peptides that are C-terminally amidated. Moreover, the synthetic AVLPRY-NH2 and PALLSRY-NH2 had identical retention times to natural peptides on RP-HPLC (Figure 1—figure supplement 2C). These data also suggest that both of the natural peptides have the deduced primary structures. These peptides have the C-terminal RYamide motif identical to that of dRYamide peptides, the authentic ligands for CG5811 (Figure 2C; Ida et al., 2011). We assigned Y75B8A.11 the gene name lury-1 (LUqin-like RYamide peptides) and designated the PALLSRY-NH2 and AVLPRY-NH2 peptides as LURY-1-1 and LURY1-2, respectively. The proneuropeptide has a characteristic of luqins with canonical pair of cysteines in the C-terminal portion (Figure 2B). Each of the peptides purified from fractions B to D was determined to be an RFamide-containing peptide generated from flp-1, flp-12, flp-6, or flp-22 based on protein sequencing and mass spectrometry (Table 1). LURY-1-1 and -2 induced concentration-dependent, robust increases in [Ca2+]i in CHO-CG5811 cells, with a half-maximal response concentration (EC50) of 1.86 × 10−9 and 1.07 × 10−9 M, respectively (Figure 2D). Neither LURY-1 peptides nor dRYamides induced a response in CHO cells transfected with vector alone (Figure 2—figure supplement 1A,B), confirming that these peptides act through CG5811. (A) Gel filtration on Sephadex G-50 (fine) of the SP-III fraction obtained from C. elegans. Red bars indicate fluorescence changes owing to [Ca2+]i increase in receptor expressing cells. (top) Non-transfected CHO cells. (middle) CHO-NPR-22a cells. (bottom) CHO-CG5811 cells. The amount of worm extracts in each [Ca2+]i assay was approximately equivalent to that from 20 mg (top, middle) or 2 mg (bottom) frozen weight of C. elegans. (B) CM-HPLC (pH 6.5) of the active fractions on the gel filtration. Red bars indicate [Ca2+]i changes in CHO-CG5811 cells. Active fractions that were further fractionated are depicted as A to D. (A, B) Blue lines indicate total protein content in each fraction as measured by absorbance at 280 nm. LURY-1 peptides are potent ligands for NPR-22. (A) Genomic organization of the lury-1/Y75B8A.11 (left) and npr-22 (right) loci and the lesions in mutant alleles. (B) Amino acid sequences of LURY-1-1 (red) and LURY-1-2 (blue) in the LURY-1 prepropeptide. lury-1 encodes an 89-residue peptide. The asterisks show glycine residues, which serve as amide donors for C-terminal amidation. The green underlines show cysteine residues which are conserved among propeptides of the luqin family. (C) Sequences comparison of C. elegans LURY-1 peptides and Drosophila dRYamides. RYamide structures conserved between the peptides are shaded. (D) Pharmacological characterization of synthetic peptides using CG5811 stably expressed in CHO cells. Dose-response relationships of changes in [Ca2+]i for LURY-1-1 (red), LURY-1-2 (blue), dRYamide-1 (orange), dRYamide-2 (brown), and FLP-7-3 (green) in CHO-CG5811 cells. (E, F) Pharmacological characterization of synthetic peptides using the A isoform (E) and the B isoform (F) of C. elegans NPR-22 stably expressed in CHO cells. Dose-response relationships of changes in [Ca2+]i for LURY-1-1 (red), LURY-1-2 (blue), and FLP-7-3 (green) in CHO-NPR-22a/b cells. Data points are means ±S.E.M. of 6 replicates for each experiment. Active fractions of each chromatography and the amino acid sequences of the purified peptides. *Peptide names other than LURY-1 peptides are taken from Li and Kim, 2008. We next investigated whether LURY-1 peptides could bind and activate NPR-22. LURY-1-1 and -2 induced concentration-dependent robust increases in [Ca2+]i in CHO-NPR-22a cells (EC50 = 1.44 × 10−8 and 2.18 × 10−8 M, respectively) (Figure 2E). Potencies of these peptides for CHO-NPR-22a cells were ~20 fold less than CHO-CG5811 cells. Mertens et al. reported that FLP-7-3 (SPMERSAMVRF-NH2) derived from FLP-7 was the most potent ligand for NPR-22 (Mertens et al., 2006). However, the potency of FLP-7-3 for CHO-NPR-22a cells in the Ca2+ assay was lower than that of LURY-1 peptides (EC50; submicromolar vs. subnanomolar range) (Figure 2E). Furthermore, each RFamide-containing peptide purified from fractions B to D had no effect in the assay used for CHO-NPR-22a cells (Figure 2—figure supplement 1C). When we used a stable CHO cell line expressing the B isoform of NPR-22 (CHO-NPR-22b), which is the only known splice variant of NPR-22a (Figure 2A), LURY-1 peptides showed similar efficacies and potencies to those for the CHO-NPR-22a cells (Figure 2F). Based on these findings, we propose that LURY-1-1 and -2, derived from the lury-1 gene, are endogenous ligands for NPR-22. We next investigated the in vivo expression patterns of the lury-1 and npr-22 genes. 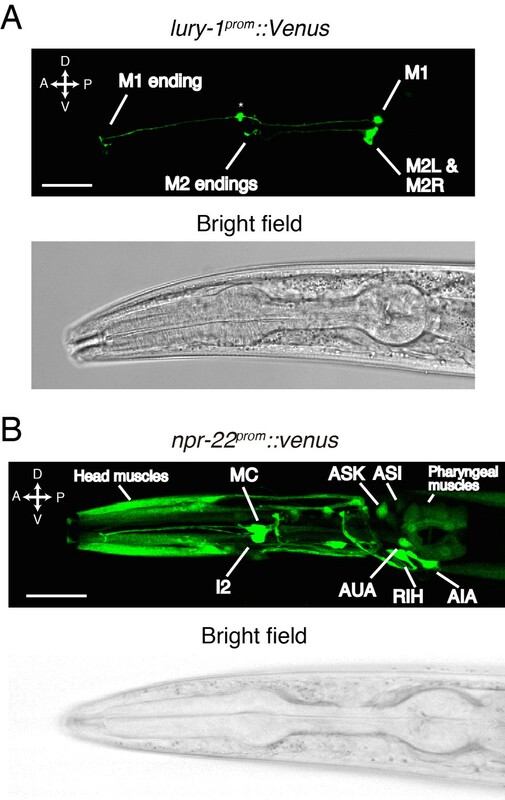 When the fluorescent reporter Venus was fused to the 3.5 kb lury-1 promoter (lury-1prom), the expression of Venus was observed only in two classes of pharyngeal neurons (Figure 3—figure supplement 1A). These neurons were identified as the M1 and M2 neurons (Figure 3A) by their morphology, position, and the co-expression of established cell markers (Kim and Li, 2004; Refai et al., 2013) (Figure 3—figure supplement 1B,C). We found that the lury-1prom::Venus reporter was robustly expressed in M1 in all larval stages and in adults, whereas its expression in M2 was not detectable in most L1–L3 worms but started to increase from the L4 stage (Figure 3A and Figure 3—figure supplement 1D). We also generated a lury-1prom::lury-1::Venus translational reporter, in which Venus is C-terminally fused in frame to the genomic lury-1-coding sequences containing introns. This translational reporter produced fluorescent signals in coelomocytes, which are macrophage-like scavenger cells that endocytose proteins secreted into the body cavity (Fares and Greenwald, 2001), as well as in the M1 and M2 neurons (Figure 3—figure supplement 1E). This result implies that the LURY-1 preproprotein is sorted into the secretory pathway and that LURY-1 peptides can reach distant cells. LURY-1 peptides are expressed in the pharyngeal M1 and M2 neurons, while NPR-22 is broadly expressed. (A) Expression pattern of lury-1prom::Venus reporter in the head region of an adult worm. Fluorescence of lury-1prom::venus was specifically observed in the M1 and M2 pharyngeal neurons in adult worms. Asterisk, a knot-like structure in the M1 axon occasionally generated by the expression of fluorescent proteins. (B) Expression pattern of Venus reporter driven by the npr-22 promoter in the head region of an adult worm. (A, B) White scale bars, 20 µm. The Venus reporter driven by the 5.7 kb npr-22 promoter was expressed in many cells mainly in the head region (Figure 3B and Figure 3—figure supplement 2A); the npr-22prom::Venus expression was observed in head muscles, the I2 neurons, the MC neurons, the RIH neuron, the AIA neurons, the AUA neurons, the ASK neurons (strong in larval worms), the ASI neurons (strong in larval worms), a few B-type motorneurons in the posterior ventral nerve cord (variable), pharyngeal muscles, body wall muscles (weak), the intestine (weak), and a few classes of unidentified cells anterior to the nerve ring (Figure 3B and Figure 3—figure supplement 2A). In the I2, MC, RIH, AIA, AUA, and posterior B-type motorneurons, we confirmed the co-expression of established cell markers (Feng and Hope, 2013; Hao et al., 2001; Kim and Li, 2004; Macosko et al., 2009; Sze et al., 2002; Tomioka et al., 2006) (Figure 3—figure supplement 2B–H). Collectively, these results raise the possibility that pharyngeal LURY-1 peptides may transmit signals to a broad range of cells. To assess the physiological functions of LURY-1 peptides, we introduced the multicopy array containing a 5.7 kb fragment spanning the lury-1 locus (extrachromosomal Ex[lury-1(+)] or chromosomally integrated peIs2413[lury-1(+)]/peIs2414[lury-1(+)]) and examined the effects of the increased copy numbers of lury-1. This multicopy expression of lury-1 caused the following phenotypes. First, numbers of unlaid eggs in the uterus were decreased (Figure 4A,B). The rate of egg-laying was not affected by the multicopy lury-1 expression (Figure 4C), indicating that in this strain the rate of ovulation is normal while egg-laying is constitutively facilitated and early-stage embryos are prematurely laid (Figure 4A). These phenotypes meet the standard criteria to be classified as egg-laying constitutive (Egl-c) (Hart, 2006) and are similar to those of the mutants previously described as Egl-c (Hawasli et al., 2004; Kwok et al., 2006; Ringstad and Horvitz, 2008) (Figure 4—figure supplement 1A,B). Second, the rate of pharyngeal pumping, which is a rhythmic muscle contraction required for food intake (Avery and You, 2012), was reduced (Figure 4D). Third, adult lifespan is extended as much as 21–50% (Figure 4E, Figure 4—figure supplement 2, and Supplementary file 1). The ectopic expression of lury-1 in all neurons using the rimb-1 promoter also caused the similar phenotypes (Figure 4B,D and Supplementary file 1). Fourth, roaming behavior, which was measured by the numbers of grid squares that were entered by the worm tracks (Fujiwara et al., 2002), was attenuated (Figure 4F). Multicopy expression of lury-1(+) causes multiple food-related phenotypes in an NPR-22-dependent manner. (A) Lateral views near the uterus of synchronized adult worms (36 hr after the L4 white-crescent stage) of wild type, Ex[lury-1(+)], and npr-22(ok1598); Ex[lury-1(+)]. Asterisk, ~30 cell stage eggs laid on agar pads during immobilization. Daggers, 2- to 4 cell stage eggs laid on an agar pad during immobilization. The number of eggs retained in the uterus is decreased in the Ex[lury-1(+)] strain. Black scale bars, 100 µm. (B) Number of unlaid eggs in the uterus of lury-1- and npr-22-related strains. N = 29, 25, 30, 24, 21, 18, 18, 24, and 18 animals (from left to right in order of each group). ***p<0.001, *p<0.05 (ANOVA with Tukey’s post-test). (C) Number of eggs laid per animal per hour. N = 8, 8, 8, 8, 8, 7, 7, 8, and 7 animals (from left to right in order of each group). ANOVA with Tukey’s post-test. n.s., not significant. (D) Pharyngeal pumping rate of lury-1- and npr-22-related strains. N = 25, 25, 26, 27, 17, 26, 17, 26, and 25 animals (from left to right in order of each group). ***p<0.001 (ANOVA with Tukey’s post-test). (E) Lifespans of lury-1- and npr-22-related strains. Details are shown in Supplementary file 1. (F) Roaming behavior of lury-1- and npr-22-related strains. Tracks of worm movement generated on food over a 4 hr period were examined. N = 12 animals. ***p<0.001 (ANOVA with Tukey’s post-test). (A–F) All strains have the myo-3prom::venus transgene as a transgenic marker. Bars represent mean ±S.E.M. Importantly, these Egl-c, slow-pumping, long-lived, and reduced-roaming phenotypes were all largely suppressed by the deletion of npr-22 (Figure 4A,B,D,E,F, Figure 4—figure supplement 2, and Supplementary file 1), indicating that lury-1(+) functions upstream of npr-22. To examine whether LURY-1 peptides are responsible for the effects of the multicopy expression of the lury-1 gene, we next administered synthetic LURY-1 peptides into adult worms using a peptide microinjection protocol (Rogers et al., 2003). When a 10 µM solution of either LURY-1-1 or LURY-1-2 was injected into wild-type worms, number of eggs retained in the uterus and pharyngeal pumping rate were reduced (Figure 5A,B), similar to worms carrying the lury-1(+) transgenic array (Figure 4B,D). These effects of the injection of LURY-1 peptides were not observed in the npr-22(ok1598) mutants (Figure 5A,B). On the other hand, neither the administration of a 10 µM solution of another putative NPR-22 ligand, FLP-73, nor the multicopy expression of its precursor gene flp-7(+) caused any Egl-c or slow-pumping phenotype (Figure 5—figure supplement 1A–D). Taken together, these results support that both LURY-1-1 and LURY-1-2 act through NPR-22 to control multiple processes. LURY-1 peptides stimulate egg-laying and suppress feeding through NPR-22. (A, B) Effects of administration of LURY-1 peptides on the number of retained eggs (A) and pharyngeal pumping (B). Each of synthetic LURY-1 peptides was injected to wild-type and npr-22(-) worms at a concentration of 10 µM. M9 dilution buffer was injected as a control. N = 16 animals. ***p<0.001 compared with buffer controls (ANOVA with Dunnett’s post-test). n.s., not significant. Bars represent mean ±S.E.M. When a proneuropeptide is tagged with a fluorescent protein, the soluble fluorescent protein is considered to be packaged into dense core vesicles (DCVs) together with the processed active neuropeptide(s) and the fluorescence can be used to monitor DCV release (Sasidharan et al., 2012; Sieburth et al., 2007). In C. elegans, the exocytosis of fluorescent proteins can be assessed by quantifying the fluorescence in coelomocytes, into which the proteins in the body cavity are concentrated (Fares and Greenwald, 2001). To examine under which conditions LURY-1 peptides are secreted, we performed this coelomocyte uptake assay, which has been used to evaluate the secretion of neuropeptides in previous studies (Ch’ng et al., 2008; Hao et al., 2012; Palamiuc et al., 2017; Rabinowitch et al., 2016; Sasidharan et al., 2012; Schild et al., 2014; Sieburth et al., 2007). When Venus is C-terminally fused to the LURY-1 coding region, the fluorescence of the Venus reporter in coelomocytes was decreased in starved worms, and was rapidly restored by subsequent refeeding (Figure 6A,B). When GFP is fused with a signal sequence for secretion and expressed in body wall muscles, the fluorescence is also accumulated in coelomocytes (Fares and Greenwald, 2001) (Figure 6—figure supplement 1A). This fluorescence reporting the constitutive secretion from muscles was unchanged by starvation or subsequent refeeding (Figure 6—figure supplement 1B). Moreover, when Venus alone was expressed under the lury-1 promoter, the fluorescence in M1 and M2 was unaffected by the presence or absence of food (Figure 6—figure supplement 1C). Therefore, the changes in the fluorescence derived from the lury-1prom::lury-1::Venus reporter in coelomocytes (Figure 6A,B) were not likely caused by the modification of the activity of coelomocytes or the lury-1 promoter. Collectively, these results suggest that the secretion of LURY-1 peptides is positively controlled by the presence of food. LURY-1 peptides are secreted in a food-dependent manner and essential for satiety-induced behavioral changes. (A) The fluorescence of lury-1prom::lury-1::venus reporter in worms that had been fed (top), fasted (middle), or fasted and refed (bottom). White arrowheads, coelomocytes (CC). Scale bars, 100 μm. (B) The secretion of the LURY-1::Venus reporter, expressed as ratios of fluorescence in coelomocytes to that in the M1 and M2 cell bodies, was quantified in worms that had been fed (naive), starved for two hours, or refed for 30–120 min after the 2 hr starvation. N = 15, 20, 16, 16, and 16 animals (from left to right in order of each condition). ***p<0.001 (ANOVA with Dunnett’s post-test). (C) Changes in number of unlaid eggs in the uterus. Animals were starved for two hours, and then refed for 15, 30, or 60 min. The results of animals that did not experience starvation are also shown (‘naïve’). N = 16, 15, 16, 16, and 15 animals (from left to right in order of each condition). ***p<0.001, **p<0.01, *p<0.05 compared with wild-type animals (ANOVA with Dunnett’s post-test). (D) Number of eggs laid per animal during 30 min refeeding. After animals were starved for two hours, they were transferred back to fresh E. coli-seeded plates. N = 16 animals. **p<0.01, *p<0.05 compared with wild-type animals (ANOVA with Dunnett’s post-test). (E) Changes in pharyngeal pumping rate. Worms were starved for two hours, and then refed for 15, 30, 60, or 120 min. The results of animals that did not experience starvation are also shown (”naive’). ***p<0.001, **p<0.01 compared with wild-type animals. ns., not significant. Bars represent mean ±S.E.M. The deletion of lury-1 or npr-22 (Figure 2A) by itself did not cause egg-laying defective, fast-pumping, short-lived, or increased-roaming phenotype under normal conditions (Figure 4B,D,E,F and Supplementary file 1), except for a weak egg-laying defective phenotype shown by the lury-1(gk961835) mutants (Figure 4B). These observations suggested the possibility that LURY-1 peptides exert their effects only under specific conditions. Considering that lury-1 is expressed in the pharyngeal M1 and M2 neurons, LURY-1 peptides might transmit the changes in the pharyngeal activity. To address this possibility, we examined the egg-laying and pharyngeal pumping behavior during refeeding after fasting, the period during which pharyngeal pumping is highly activated and subsequently suppressed (You et al., 2008) (Figure 6E, WT). In wild-type worms, the egg-laying behavior is dramatically inhibited upon food deprivation but it resumes if they are returned to food, which apparently increases the offspring's chance of growing in a food-rich environment (Dong et al., 2000). We found that the lury-1(gk961835) and npr-22(ok1598) mutants normally retained eggs in their body after 2 hr starvation (Figure 6C). However, in the lury-1(gk961835) and npr-22(ok1598) mutants, the numbers of eggs laid during the initial 30 min refeeding period were decreased (Figure 6D), and the numbers of unlaid eggs in the uterus returned to baseline of fed worms more slowly during the refeeding period than in wild type (Figure 6C). We also found that the lury-1(gk961835) and npr-22(ok1598) mutants normally elevated their pharyngeal pumping shortly after refeeding, but showed their satiety-induced suppression of pharyngeal pumping (You et al., 2008) more slowly than wild type (Figure 6E). 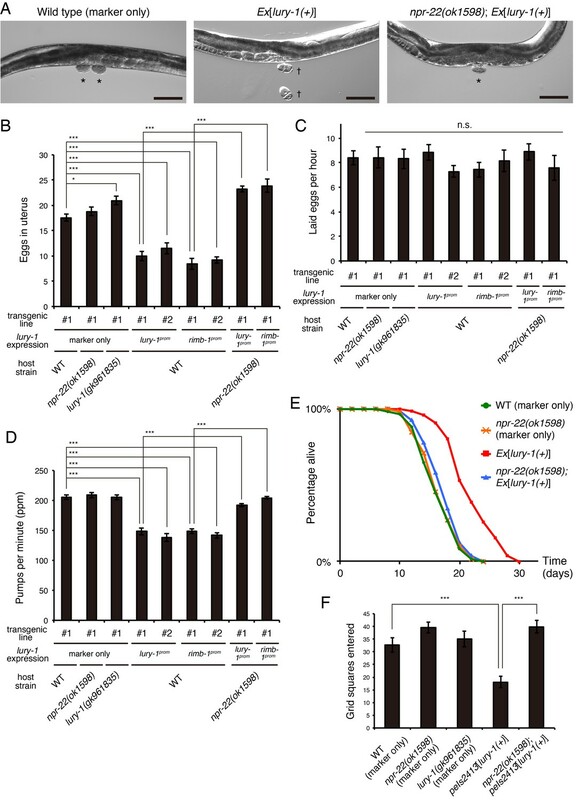 These results might suggest that the activities of LURY-1 peptides and NPR-22 are latent under normal culture conditions and that LURY-1 peptides exert their actions under certain conditions that induce hyperactivation of pharynx, such as abrupt refeeding after starvation, along with other signals such as insulin and TGF-β (You et al., 2008). To determine where the LURY-1 peptides-mediated signals are received, we expressed the npr-22 cDNA in the peIs2413[lury-1(+)]; npr-22 mutants using various cell-specific promoters and examined whether the effects of multicopy expression of lury-1(+) were restored. When either of the two npr-22 isoforms (npr-22a and npr-22b; Figure 2A) was expressed under the authentic npr-22 promoter, both isoforms were found to be able to restore the egg-laying-stimulatory and feeding-suppressive effects of the multicopy expression of lury-1(+) in the npr-22 mutant background (Figure 7—figure supplement 1A and Figure 8—figure supplement 1A), consistent with the results of the [Ca2+]i assays showing that both isoforms are functional LURY-1 peptides receptors (Figure 2E,F). We used npr-22a for the following cell-specific rescue experiments. We found that the expression of npr-22a driven by the ceh-19 promoter, which induces the expression in MC, ADF, and PHA (Feng and Hope, 2013) (Figure 3—figure supplement 2C), was sufficient for the mediation of the suppressive effects of lury-1(+) on feeding (Figure 7A). In contrast, when npr-22a was expressed in npr-22-expressing cells other than MC (driven by the ins-1, ges-1, cat-1, flp-15, myo-2, myo-3, and acr-2 promoters), in ADF (driven by the cat-1 promoter), or in PHA (driven by the flp-15 promoter), feeding was not affected in the peIs2413[lury-1(+)]; npr-22 background (Figure 7A and Figure 7—figure supplement 1B), suggesting that the expression of npr-22a in MC is important. To further restrict the expression site of npr-22 to the left/right pair of the single MC class (MCL and MCR), we next employed the FLP-FRT gene activation system (Davis et al., 2008), in which FLP-mediated recombination between two FRT sites allows the transgene expression (Davis et al., 2008) (Figure 7B). When npr-22prom::FLP and ceh-19prom::FRT::terminator::FRT (FTF)::npr-22a::sl2::mCherry transgenes were introduced into worms, the mCherry transcriptional reporter placed downstream of the trans-spliced leader sequence SL2 was specifically expressed in the two MC neurons (Figure 7C), in which both npr-22prom and ceh-19prom are active (Figure 3—figure supplement 2C). 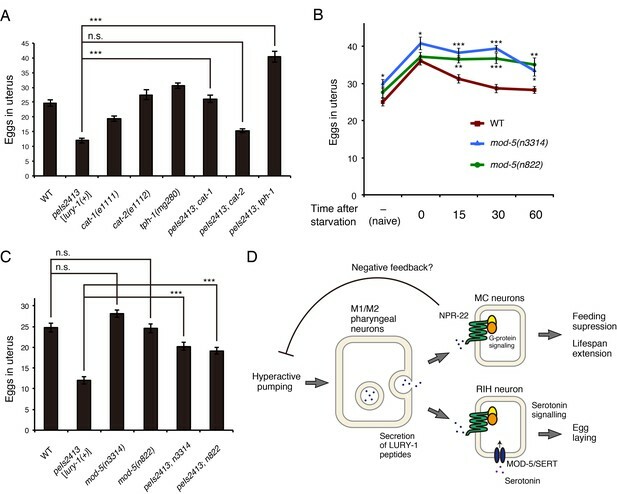 The MC-specific expression of npr-22a using this system was sufficient for the mediation of the suppressive effects of lury-1(+) on feeding in the npr-22 mutant background (Figure 7D). Therefore, we conclude that NPR-22 is likely to act in MC, which are known to be important neurons for the stimulation of food pumping (Raizen et al., 1995; Trojanowski et al., 2014), to control feeding. The expression of npr-22a driven by the ceh-19 promoter also rescued the shortened lifespan of peIs2413[lury-1(+)]; npr-22 (Figure 7E), implying the relationship between feeding suppression and extended lifespan mediated by lury-1(+). NPR-22 acts in MC to control feeding and lifespan. (A) Pharyngeal pumping rate of animals expressing npr-22a under indicated promoters. N = 13, 12, 12, 12, 12, 12, 12, 12, 12, and 12 animals (from left to right in order of each group). (B) Schematic of the FLP recombinase technology to restrict the npr-22 expression to single cells. (C) MC-specific expression of the mCherry reporter driven by the combination of npr-22prom::FLP and ceh-19prom::FTF::npr-22::sl2::mCherry transgenes. The magnified view of the head is shown in the lower panels. Yellow scale bar, 100 µm. White scale bar, 20 µm. (D) Pharyngeal pumping rate of animals expressing npr-22a specifically in RIH or MC. N = 16 animals. (E) Lifespans of animals expressing npr-22a driven by the ceh-19 or cat-1 promoter. Details are shown in Supplementary file 1. (A, D) ***p<0.001, *p<0.05 compared with npr-22(ok1598); peIs2413 animals carrying only the transformation marker (−) (ANOVA with Dunnett’s post-test). Bars represent mean ±S.E.M. In the regulation of egg-laying, the Egl-c phenotype reappeared when npr-22a was expressed in serotonergic/dopaminergic neurons under the cat-1 promoter in the peIs2413[lury-1(+)]; npr-22 strain (Figure 8A). The RIH neuron is the only cell in which the expression patterns induced by the npr-22 and cat-1 promoters overlap (Figure 3—figure supplement 2D). Moreover, the Egl-c phenotype was also restored by the expression of npr-22a under the slt-1 promoter (Figure 8A), which is also active in the RIH neuron (Hao et al., 2001) (Figure 3—figure supplement 2E). We also observed that the RIH-specific expression of npr-22a driven by the FLP-FRT gene activation system using npr-22prom and cat-1prom (Figures 7B and 8B) rescued the npr-22 mutant phenotype in the egg-laying regulation (Figure 8C), whereas the expression of npr-22a in npr-22-expressing cells other than RIH had no effects (Figure 8A,C and Figure 8—figure supplement 1B). These results suggest that the action of NPR-22 in RIH is important for the facilitation of egg-laying. NPR-22 acts in RIH to control egg-laying. (A) Number of unlaid eggs in the uterus of animals expressing npr-22a under indicated promoters. N = 18, 18, 18, 19, 18, 18, 20, 18, 18, 19, and 18 animals (from left to right in order of each group). (B) RIH-specific expression of the mCherry reporter driven by the combination of cat-1prom::FLP and npr-22prom::FTF::npr-22::sl2::mCherry transgenes. The magnified view of the head is shown in the lower panels. Yellow scale bar, 100 µm. White scale bar, 20 µm. (C) Number of unlaid eggs in the uterus of animals expressing npr-22a specifically in RIH or MC. N = 16 animals. (A, C) ***p<0.001 compared with npr-22(ok1598); peIs2413 animals carrying only the unc-122prom::mCherry transformation marker (−) (ANOVA with Dunnett’s post-test). Bars represent mean ±S.E.M. The RIH neuron does not express serotonin [5-hydroxytryptamine (5-HT)] biosynthesis enzymes but uptake serotonin from extracellular space through MOD-5/serotonin reuptake transporter (SERT) (Jafari et al., 2011), and serotonin regulates many food-associated processes including egg-laying (Chase and Koelle, 2007; Sze et al., 2000). To examine whether serotonin signaling is involved in the LURY-1 peptides-mediated control of egg-laying, we examined the genetic interaction between lury-1 and genes for monoaminergic signaling. The Egl-c phenotype caused by the multicopy expression of lury-1(+) was partially suppressed by a nonsense mutation in cat-1 (Figure 9A), which encodes the putative synaptic vesicular transporter for serotonin, dopamine, tyramine, and octopamine (Chase and Koelle, 2007; Duerr et al., 1999). Moreover, a null mutation in tph-1, which encodes the serotonin synthetic enzyme tryptophan hydroxylase, suppressed the Egl-c phenotype (Figure 9A), whereas a null mutation in cat-2, which encodes the dopamine synthetic enzyme tyrosine hydroxylase, did not affect egg-laying (Figure 9A). Serotonin signaling is essential for the LURY-1 peptide-dependent stimulation of egg-laying. (A) Genetic interaction between peIs2413[lury-1(+)] and monoamine-related genes in number of unlaid eggs in the uterus. N = 20 animals. (B) Changes in number of unlaid eggs in the uterus. Animals were starved for two hours, and then refed for 15, 30, or 60 min. The results of animals that did not experience starvation are also shown (‘naïve’). N = 16 animals for each condition. (C) Genetic interaction between peIs2413[lury-1(+)] and two alleles of mod-5 in number of unlaid eggs in the uterus. N = 20 animals. The data for WT and pe2413 are the same as shown in (A). ***p<0.001 (ANOVA with Tukey’s post-test). (D) Schematic model representing the mechanism of action of LURY-1 peptides. (A, B) ***p<0.001, **p<0.01, *p<0.05 (ANOVA with Dunnett’s post-test). n.s., not significant. Bars represent mean ±S.E.M. When two alleles of mod-5 mutants, mod-5(n3314) and mod-5(n822), experienced starvation and then refed, the numbers of unlaid eggs decreased more slowly than wild type during the refeeding period (Figure 9B), like in the lury-1 and npr-22 mutants (Figure 6C). Furthermore, the Egl-c phenotype caused by the multicopy lury-1(+) expression was partially suppressed by the mutations in mod-5 (Figure 9C). Collectively, these results imply that LURY-1 peptides facilitate egg-laying through serotonin signaling derived from RIH. Using a reverse pharmacological technique, we here identify pharyngeal LURY-1-1 and -2 peptides, encoded by the lury-1 gene, as endogenous ligands for NPR-22. LURY-1 peptides are secreted from the pharyngeal neurons M1 and M2 and control feeding, egg-laying, lifespan, and roaming behavior through NPR-22. Our cell-specific rescue experiments and genetic analyses suggest that NPR-22 acts in the feeding pacemaker MC neurons to control feeding and lifespan, whereas it acts upstream of serotonergic signals derived from the serotonin-uptaking RIH neuron to control egg-laying. Based on these results, together with the observation that the lury-1(gk961835) and npr-22(ok1598) deletion mutants reduced egg-laying and elevated feeding during the refeeding period after starvation, we propose a model in which LURY-1 peptides convey information about the food-evoked activation of pharynx to control multiple processes through the broadly expressed NPR-22 (Figure 9D). The distance and the lack of synaptic connection between the LURY-1 peptides-secreting neurons and RIH suggest that LURY-1 peptides can function in a hormone-like manner. Several FMRFamide-related peptides, such as FLP-7–3, have previously been reported to be ligands of NPR-22 (Mertens et al., 2006; Palamiuc et al., 2017). However, in our hands, FLP-7–3 elicited a much weaker calcium response in CHO-NPR-22 cells than LURY-1 peptides (Figure 2E,F) and did not affect egg laying nor pharyngeal pumping (Figure 5—figure supplement 1), both of which are shown to be regulated by NPR-22 (Figure 4). 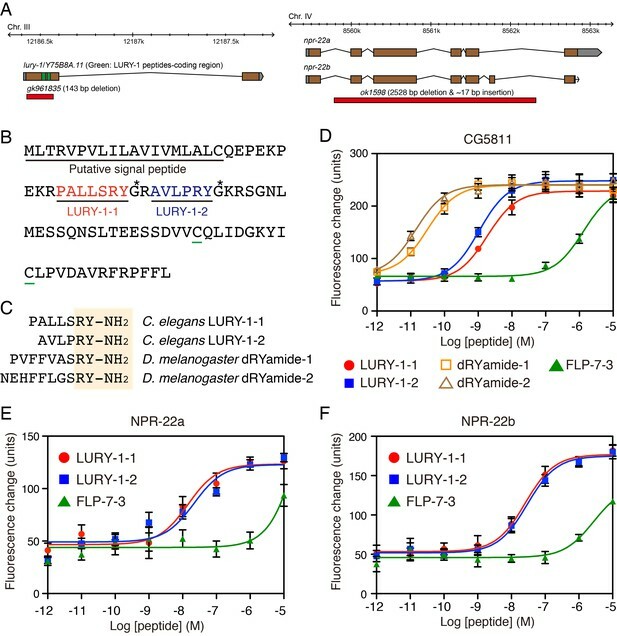 Together with the finding that the lury-1(gk961835) and npr-22(ok1598) deletion mutants showed similar egg-laying and feeding phenotypes (Figure 6C–E), we conclude that LURY-1 peptides act as endogenous ligands of NPR-22. The findings in our study and a previous study (Palamiuc et al., 2017) suggest that the two classes of NPR-22 ligands, LURY-1 peptides and FLP-7-derived peptides, mediate, at least in part, distinct functions. Intriguingly, all the phenotypes caused by the multicopy expression of lury-1(+) (Figure 4) are strongly related to feeding. Suppression of feeding, facilitation of egg-laying, and attenuation of locomotory behavior are all induced by the presence of abundant food (Waggoner et al., 2000; You et al., 2008). Lifespan extension has also been closely associated with feeding (Lakowski and Hekimi, 1998). Our results that both the lifespan and feeding phenotypes of the npr-22 mutants were rescued by the npr-22 expression under the ceh-19 promoter (Figure 7A,E) imply that the lury-1(+)-mediated lifespan extension was caused by reduced feeding. Moreover, the secretion of LURY-1 peptides apparently depends on the presence of food (Figure 6A,B). Taken together, these observations raise the possibility that LURY-1 peptides transmit food-related signals from pharynx, which plays critical roles in the C. elegans digestive system (Albertson and Thomson, 1976). Such a hypothesis is reminiscent of the mode of action of mammalian PYY and PP, which are also anorexigenic peptides derived from digestive organs (Loh et al., 2015). Interestingly, feeding suppressive effects of RYamide-containing peptides have also been observed in blowflies (Maeda et al., 2015) and kuruma shrimps (Mekata et al., 2017). Although serotonin signaling in RIH is highly likely to mediate the effects of LURY-1 peptides on egg laying, the fact that serotonin signaling functions in HSN to facilitate egg-laying (Chase and Koelle, 2007) may complicate the interpretation of our results. The partial suppression of the LURY-1 peptide-mediated Egl-c phenotype by the mod-5 mutations (Figure 9C) may imply the involvement of a cell(s) other than RIH and/or the parallel actions of LURY-1 peptides and serotonin. It is also unclear how NPR-22 controls the cell functions. Our results imply that NPR-22 suppresses the activity of the feeding pacemaker neurons MC and elevates serotonin signaling in RIH. NPR-22 may couple to different types of G-protein in different cells. Future studies will be needed to identify the downstream factors of NPR-22 and the functions of NPR-22-expressing cells other than MC and RIH. It is noteworthy that the lury-1-expressing M1 and M2 neurons may have opposite functions in feeding. The M1 neuron responds to short wavelength light and stimulates spitting behavior (Bhatla et al., 2015), whereas the M2 neurons possess gap junction with the MC neurons and are stimulatory for pharyngeal pumping (Albertson and Thomson, 1976; Trojanowski et al., 2014). The significance of the expression of lury-1 in these distinct neurons and the roles of the co-transmitters expressed in these neurons, such as acetylcholine and NLP/FLP neuropeptides (Nathoo et al., 2001; Pereira et al., 2015; Rogers et al., 2003), are important topics for future studies. We suppose that the lury-1 promoter, which induces the highly specific transgene expression in M1 and M2 (Figure 3A), will be useful for examining the physiological functions of these neurons. Especially, manipulation of the neural activities or other cellular functions of these neurons will be important to precisely describe the roles of LURY-1 peptides in future studies, because we cannot exclude the possibility from our results that the multi-copy expression and/or the deletion of lury-1 do not mimic the natural changes in the functions of LURY-1 peptides, and because the roles of the co-transmitters expressed in M1 and M2 remain unclear. Biochemical identification and characterization of bioactive peptides have been relatively less reported in genetically-tractable small organisms such as C. elegans, making it difficult to conduct comparative analyses of peptides across classes or species. Our description of pharyngeal LURY-1 peptides in this study might lead to the discovery of relevant peptides and receptors in other organismal classes and re-evaluation of the functions of swallowing-related organs including pharynx, which have not received much attention in mammalian endocrinology, despite their direct involvement in feeding. Bristol N2 was used as the wild-type C. elegans. Worms were raised on NGM using the standard methods (Brenner, 1974). The Escherichia coli strain HB101 was used as a food source. Strains used in this study are listed in Supplementary file 2. The full-length cDNA of C. elegans NPR-22a (Y59H11AL.1; GenBank accession number NM_001028369.2; residues 12–1343) was obtained by RT-PCR, with C. elegans cDNA as the template. The sense and antisense primers were 5′-cacccgtcatctaattcgtgagcaaa-3′ and 5′-tctatggtcttctatagctttccac-3′, respectively. The full-length cDNA of C. elegans NPR-22b (Y59H11AL.1; GenBank accession number NM_001028370.3; residues 35–1339) was obtained by gene synthesis (Eurofins Genomics, Tokyo, Japan). The amplified cDNA was cloned into a pcDNA3.2 vector (Invitrogen, Tokyo, Japan) and transfected into Chinese hamster ovary cells deficient of dihydrofolate reductase (CHO-dhfr-, provided by Dr. Kaoru Miyamoto and used as a standard cell line in the Kojima, Miyazato, and Ida laboratories). The CHO cell line was tested negative for mycoplasma contamination using VenorGem Classic Mycoplasma Testing PCR Kit (Minerva Biolabs, Berlin, Germany), and was not found to be on the list of commonly misidentified cell lines (International Cell Line Authentication Committee). Thereafter, stably expressing cells were selected using 1 mg/ml G418 (Nacalai Tesque, Kyoto, Japan). The selected cell lines, CHO-NPR-22a-line 7-3 and CHO-NPR-22b-line 11-2, which showed the highest expression of NPR-22a and NPR-22b mRNA, respectively, were used in this study. During the purification process, the activity of LURY-1 peptides was followed by measuring changes in intracellular calcium concentrations ([Ca2+]i) with the FlexStation 3 fluorometric imaging plate reader (Molecular Devices, CA, USA) in a cell line stably expressing Drosophila CG5811 (CHO-CG5811-line 7-4), as described previously (Ida et al., 2011). Boiled frozen worms (100 g) were used as the starting material. A basic peptide fraction (SP-III) was prepared as described previously (Ida et al., 2007) and then fractionated on a Sephadex G-50 gel filtration column (1.7 × 130 cm; GE Healthcare, Tokyo, Japan). A portion (0.002%) of each fraction, equivalent to 2 mg frozen weight, was subjected to the assay using CHO-CG5811 cells. The active fractions were separated by CM-HPLC on a TSK CM-2SW column (4.6 × 250 mm; Tosoh, Tokyo, Japan) with a linear gradient of 0.01 to 0.6 M ammonium formate (pH6.5) in the presence of 10% acetonitrile (ACN) at a flow rate of 1 ml/min over 2 hr. Four distinct active fractions (fractions A–D, Figure 1B) were further purified by fractionation on the same column at pH 4.8. The active fractions were separated by RP-HPLC using a Symmetry C18 column (3.9 × 150 mm, Waters, MA, USA) with a linear gradient of 10% to 60% ACN containing 0.1% trifluoroacetic acid (TFA) at a flow rate of 1 ml/min for 80 min. The active peaks were finally purified manually by RP-HPLC using a Chemcosorb 3ODS-H column (2.1 × 75 mm; Chemco, Osaka, Japan) with a linear gradient of 10% to 60% ACN/0.1% TFA at a flow rate of 0.2 ml/min for 80 min. The final purified peptides were analyzed with a protein sequencer (model 494; Applied Biosystems, CA, USA) and a mass spectrometry (TOF/TOF 5800 system; AB Sciex, MA, USA). A tblastn search of the C. elegans nucleotide databases was performed using the amino-acid sequence of the purified peptides, and a C. elegans mRNA sequence (lury-1/Y75B8A.11; GenBank accession number NM_001268231.1) derived from an annotated nucleotide sequence was obtained. Based on this sequence, we designed sequence-specific primers (5′-aatccaatcatgctcacaagg-3′; 5′-gagaggtttcacaaaaagaacg-3′). RT-PCR was performed with C. elegans cDNA as the template. The candidate PCR product was subcloned into the pCR-II TOPO vector (Invitrogen) and sequenced by a DNA sequencer (model 3100; Applied Biosystems). The cDNA sequence was determined from six independent clones. LURY-1-1, LURY-1-2, and FLP-7-3 were chemically synthesized by Scrum Inc. (Tokyo, Japan). FLP-1-6 (PNFLRF-NH2), FLP-6-1 (KSAYMRF-NH2), FLP-12 (RNKFEFIRF-NH2), and FLP-22 (SPSAKWMRF-NH2) were chemically synthesized by Peptide 2.0 Inc. (VA, USA). Animals were mounted on 5% agar with 10 mM NaN3. Soon after immobilization, images were captured using a Leica HCX PL APO 40×/0.85 CORR CS objective or an HC PL APO 10×/0.40 CS objective on a Leica TCS-SP5 confocal microscope. For examination of effects of starvation and refeeding (Figure 6A,B and Figure 6—figure supplement 1B,C), animals that were starved for two hours in basal buffer (50 mM NaCl, 5 mM potassium phosphate [pH 6.0], 1 mM CaCl2, 1 mM MgSO4, 0.05% gelatin) or refed on fresh HB101-seeded NGM plates again for the indicated times after the 2 hr starvation were observed. The number of unlaid eggs in the uterus was quantified as described previously (Koelle and Horvitz, 1996). White-crescent stage L4 worms were transferred to fresh HB101-seeded NGM plates and were allowed to grow for 36–38 hr at 20°C. Synchronized adult worms were then individually dissolved in five-times diluted commercial bleach solution (Kitchen Heiter, Kao, Tokyo, Japan; final sodium hypochlorite concentration is ~1%) in a flat-bottom 96-well plate and their eggs were counted under a dissecting microscope. For examination of effects of starvation and refeeding (Figures 6C and 9B), synchronized adult worms that were starved for two hours in basal buffer (50 mM NaCl, 5 mM potassium phosphate [pH 6.0], 1 mM CaCl2, 1 mM MgSO4, 0.05% gelatin) or refed on fresh HB101-seeded NGM plates again for the indicated times after the 2 hr starvation were dissolved. White-crescent stage L4 worms were transferred to fresh HB101-seeded NGM plates and were allowed to grow for 36–38 hr at 20°C. The worms were again transferred to fresh HB101-seeded NGM plates gently and were allowed to lay eggs for 1 hr at 20°C. For examination of effects of starvation and refeeding (Figure 6D), synchronized adult worms were starved for two hours in basal buffer (50 mM NaCl, 5 mM potassium phosphate [pH 6.0], 1 mM CaCl2, 1 mM MgSO4, 0.05% gelatin) and refed on fresh HB101-seeded NGM plates for 30 min. Laid eggs were counted under a dissecting microscope. Young adult worms were transferred to fresh HB101-seeded NGM plates and left for more than two hours at room temperature (23°C). Food pumping rate was then measured on the plates by counting grinder movements in the pharyngeal terminal bulb with a Zeiss (Oberkochen, Germany) Axiovert S100 inverted microscope. For examination of effects of starvation and refeeding (Figure 6E), worms that were starved for two hours in basal buffer (50 mM NaCl, 5 mM potassium phosphate [pH 6.0], 1 mM CaCl2, 1 mM MgSO4, 0.05% gelatin) were transferred to HB101-free NGM plates (time ‘0’) or refed on fresh HB101-seeded NGM plates again for the indicated times (time ‘15’, '30’, '60’, and '120’) after the 2 hr starvation and their pumping rate was immediately measured. Lifespan assays were performed as previously described (Ohno et al., 2014) with modifications. Animals were raised at 20°C until the L4 stage and then gently transferred to HB101-seeded plates containing 10 µg/ml 5-fluorodeoxyuridine (FUdR). Following transfer (day 0), the plates were incubated at 22°C. Animals were observed every other day and scored as dead when they no longer responded to gentle touch with a platinum wire. Young adult worms were singly and gently transferred to fresh HB101-seeded NGM plates (diameter: 6 cm) and left for four hours in the dark at room temperature (23°C). After removing the worms, each plate was superimposed on a grid containing 5 mm squares and the number of squares that were entered by the worm tracks was counted. Microinjection of peptides was performed as previously described (Rogers et al., 2003) with modifications. Synthetic LURY-1-1, LURY-1-2, or FLP-7-3 was diluted to a concentration of 10 µM in M9 buffer and then filtered through 0.22 µm filters (Merck Millipore, Billerica, MA). Each peptide solution or M9 buffer (control) was injected slightly posterior to the dorsal part of the pharyngeal terminal bulb using standard microinjection techniques (Mello et al., 1991). Each solution was injected until the diameter of its spread reached approximately 5–10 µm (one sixth to one third of the diameter of the terminal bulb of pharynx). The estimated injected amount is around 100 fL. The injected worms were transferred to fresh HB101-seeded NGM plates and incubated at room temperature (23°C). Their pharyngeal pumping rate and the number of eggs in their uterus were then counted 3 hr and 4 hr after microinjection, respectively. Expression constructs were injected at 2–50 ng/µl along with a co-injection marker and pPD49.26 (a gift from A. Fire) as a carrier DNA. We utilized the co-injection marker transgenes myo-3prom::venus, lin-44prom::gfp, or unc-122prom::mCherry injected at 10–20 ng/µl. In each case, the total concentration of injected DNA was 100 ng/µl. In some strains (Supplementary file 2), the transgenes were amplified via PCR and the obtained linear vector-free DNA fragments were injected at 20–50 ng/µl after purification (Etchberger and Hobert, 2008). lury-1(+) genomic DNA (5,689 bp) was amplified via PCR using primers 5′-ctacagtaatcctaccgcactc-3′ and 5′-tattcaaatcacgggcggag-3′. For peIs2413 and peIs2414 strains, chromosomal integration of the lury-1(+) genomic DNA and the co-injected myo-3prom::venus transformation marker was induced using UV irradiation (300 µJ/cm2). Each integrated strain was backcrossed six times with N2. flp-7(+) genomic DNA (4981 bp) was amplified via PCR using primers 5′-cactatgcggtcattacacgtc-3′ and 5′-aggcatcctctatcccaatataac-3′. The construction of pDEST-venus, pDEST-mCherry, pENTR-ins-1prom, pENTR-ges-1prom, pENTR-myo-3prom, pENTR-rimb-1prom (pENTR-H20p), pG-myo-3prom::venus, and pG-unc-122prom::mCherry was described previously (Ohno et al., 2014; Tomioka et al., 2006). For pDEST-npr-22a and pDEST-npr-22b, the npr-22a and npr-22b cDNAs, respectively, obtained by PCR from the NPR-22-pcDNA3.2 expression vectors (see above), were inserted into the NheI-KpnI sites of the pPD-DEST vector. For pDEST-FTF::npr-22a::SL2::mCherry, the FRT-terminator (let-858 3′-UTR)-FRT fragment (FTF), npr-22a cDNA, the trans-spliced leader sequence SL2, and mCherry cDNA were concatenated and cloned into the pPD-DEST vector by a PCR-based method. For pDEST-FLP, the MluI-NheI fragment from pWD79-2RV (a gift from E. M. Jorgensen) was cloned into the pPD-DEST vector. The PCR-amplified myo-2 promoter (1.2 kb) and acr-2 promoter (1.9 kb) were cloned into pDONR201 (Invitrogen) through BP reaction (site-specific recombination) to create pENTR-myo-2prom and pENTR-acr-2prom, respectively. For pENTR-lury-1prom, pENTR-npr-22prom, pENTR-flp-18prom, pENTR-flp-15prom, pENTR-ceh-19prom, pENTR-cat-1prom, pENTR-slt-1prom, and pENTR-acr-5prom, the PCR-amplified lury-1 promoter (3.5 kb), npr-22 promoter (5.7 kb), flp-18 promoter (4.2 kb), flp-15 promoter (2.4 kb), ceh-19 promoter (1.5 kb), cat-1 promoter (4.0 kb), slt-1 promoter (4.4 kb), and acr-5 promoter (4.2 kb), respectively, were inserted into the pENTR1A vector (Invitrogen). The expression constructs of pG-lury-1prom::venus, pG-lury-1prom::mCherry, pG-npr-22prom::venus, pG-npr-22prom::mCherry, pG-flp-18prom::venus, pG-flp-15prom::venus, pG-ceh-19prom::venus, pG-cat-1prom::venus, pG-slt-1prom::venus, pG-ins-1prom::venus, pG-acr-5prom::venus, pG-npr-22prom::npr-22a, pG-npr-22prom::npr-22b, pG-rimb-1prom::npr-22a, pG-ceh-19prom::npr-22a, pG-ins-1prom::npr-22a, pG-ges-1prom::npr-22a, pG-cat-1prom::npr-22a, pG-flp-15prom::npr-22a, pG-myo-2prom::npr-22a, pG-myo-3prom::npr-22a, pG-slt-1prom::npr-22a, pG-acr-2prom::npr-22a, pG-npr-22prom::FLP, pG-cat-1prom::FLP, pG-npr-22prom::FTF::npr-22a::SL2::mCherry, and pG-ceh-19prom::FTF::npr-22a::SL2::mCherry were created by LR reactions (site-specific recombination) between the pENTR plasmids and the pDEST plasmids (Ohno et al., 2014). For pG-lury-1prom::lury-1(with intron)::venus, the genomic coding region of lury-1 (from the start codon to the last codon before the stop codon) was fused to venus::unc-54 3′-UTR by a PCR-based method and cloned into the XhoI and ApaI sites of pG-lury-1prom::venus. The expression constructs of lury-1(+) genomic DNA (5,689 bp, see above), flp-7(+) genomic DNA (4,981 bp, see above), rimb-1prom::lury-1(+), glr-2prom::venus and npr-1prom::venus were created by PCR-based methods. Further details of all constructs will be provided upon request. No statistical methods were used to predetermine sample size, although our sample sizes are similar to those previously reported. Most experiments were repeated on two to four separate days. Statistic analyses were performed using Prism v.5 (GraphPad software, San Diego, CA). We did not exclude any data in our statistic analyses. Data in all bar graphs are presented as mean ±S.E.M. Philosophical Transactions of the Royal Society B: Biological Sciences 275:299–325. 1–20, Obesity and the regulation of fat metabolism, WormBook, 10.1895/wormbook.1.130.1. 1–23, C. elegans feeding, WormBook. 1–15, Biogenic amine neurotransmitters in C. elegans, WormBook. General and Comparative Endocrinology 206:96–110. Biochemical and Biophysical Research Communications 412:578–583. Journal of Proteome Research 10:4478–4504. Journal of Proteome Research 9:5296–5310. Biochemical and Biophysical Research Communications 410:872–877. The Journal of Comparative Neurology 475:540–550. The Journal of biological chemistry 267:9–12. Trends in Endocrinology & Metabolism 26:125–135. General and Comparative Endocrinology 246:321–330. General and Comparative Endocrinology 167:86–103. Thank you for submitting your article "NPY-like peptides, CeRYamides, regulate food-evoked responses in C. elegans" for consideration by eLife. Your article has been reviewed by three peer reviewers, and the evaluation has been overseen by a Reviewing Editor and Eve Marder as the Senior Editor. The following individual involved in review of your submission has agreed to reveal his identity: Gáspár Jékely (Reviewer #3). 1) Putting your work in broader context, particularly in relation to previous work in other invertebrate and vertebrate systems (reviewer #2). This includes a toning down of the novelty of your observations. 2) As detailed by reviewer #3, the phylogenetic analysis of the ligand/receptor system needs to be fundamentally revised and the system should be referred to as suggested by this reviewer. We are including the full sets of initial reviews so that you see the context for 1) and 2) above. This manuscript reports the biochemical discovery of two C. elegans neuropeptides related to the RY-amide peptides of mammals and Drosophila whose release is regulated by feeding and that in turn regulate behaviors that respond to feeding. The authors identify the C. elegans NPR-22 protein as the receptor for the worm peptides using both cell-based activation assays and C. elegans genetic experiments. They show the peptides are expressed in and functionally released from a pair of neurons in the pharynx, the feeding organ of C. elegans. 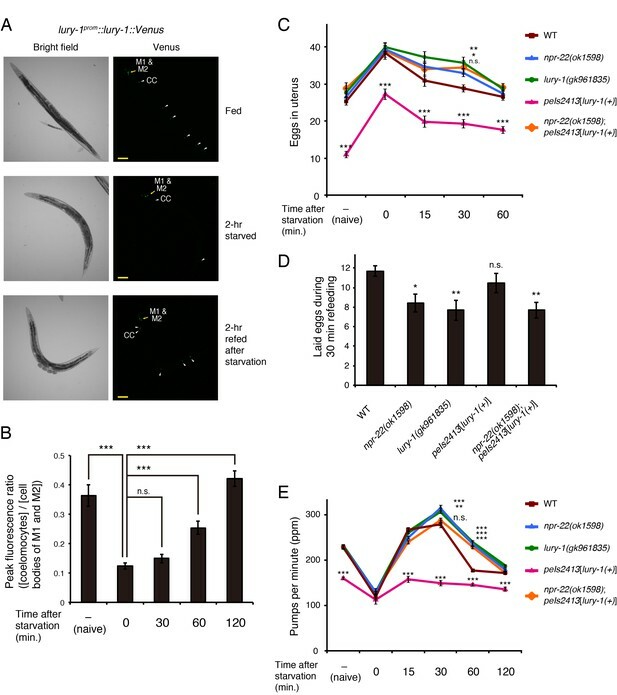 They show that transgenic overexpression or injection of the peptides into C. elegans affects four different behaviors that are normally regulated by feeding. They identify the specific neurons that expression NPR-22 and show which of these neurons appear to mediate each behavioral effect of the overexpressed peptides. Knocking out the peptide gene or the receptor gene has no effects on behavior under well fed conditions, but the authors show that two of the behavioral effects of re-feeding starved animals depend, albeit subtly, on both the peptide and receptor gene. Their results support a model in which re-feeding leads to high activity of the pharyngeal neurons, release of the peptides, and their subsequent control of specific behaviors. This paper will be of interest to: 1) those studying neuropeptide signaling in the C. elegans system; 2) those studying NPY-like peptide signaling in mammals and fruit flies, and those interested in general in signaling control of feeding and control of other behaviors by feeding. The paper has several strong points. The biochemical identification of active peptides from C. elegans extracts is very impressive. This has been rarely done in the past, and there is a huge problem in the field of trying to match orphan neuropeptide receptor homologs with ligands. It is impressive to see this biochemical approach used so successfully. Also, the experimental work in this paper is almost without exception meticulous and impressive. The supplemental figures, for example, show really impressive use of cell specific markers to identify cells expressing the peptide and receptor genes, and the quality of the work in these experiments typifies the rest of the work in the paper. The identification of loss of function phenotypes for the peptide and receptor genes is a key issue in evaluating this paper. It is a general problem that loss of function mutant phenotypes for neuropeptides and their receptors are very difficult to identify. It appears that a typical neuropeptide is released and has effects only under very particular conditions and then has very specific effects, so finding these is like hunting for a needle in a haystack. The authors use a clever and potentially generalizable approach to solve this problem. They first identify the specific cells that express the peptide and receptor, and use the detailed existing knowledge of worm neural functions to be able to guess possible functions to test. They next find phenotypic effects of overexpressing or injecting the peptides. They then try varying the conditions in which they culture the worms (feeding and starving) to eventually find related phenotypic defects in the loss of function mutants. The paper could be criticized in that the loss of function effects seen are quite subtle, and certainly it would be nice if they were stronger. However, the current state of the field is such that it is impressive to see any loss of function effects for neuropeptide or neuropeptide receptor loss of function mutants. This is an interesting, detailed study which identifies, localizes and determines the feeding-related functions of a pair of RYamide neuropeptides in C. elegans. In addition to its contributions towards understanding the neuronal basis of behavior in C. elegans, this work establishes that this peptide family shares with family members in several other animals (molluscs, arthropods, mammals) a functional influence on feeding-related behaviors. Enthusiasm is a bit tempered by (a) some discomfort regarding the extent to which the conclusions are touted as establishing the universality of RYamides for feeding, and (b) confusion regarding the identity of FLP-7 and its receptor, NPR-22. These issues are discussed below. This work should be of interest to the broad readership of eLife. 1) Impact statement/Elsewhere - "unexpected parallels between the feeding regulatory mechanisms in C. elegans, arthropods, and mammals mediated by neuropeptides with common C-terminal RYamide motifs." At various locations in the manuscript (e.g. Abstract, Impact Statement, end of Introduction, Discussion), of which the partial quote from the Impact Statement is one example, the impact of the results are used to establish the generality of this peptide family with respect to feeding-related behaviors across animal classes. However, this "generality" was already evident. As indicated in the text (e.g. Introdusction and elsewhere), what this paper does (and does very nicely!) is to extend to C. elegans the results of many previous studies in a number of other, disparate animal groups (e.g. molluscs, insects, crustaceans, mammals). It seems more appropriate to indicate that these new data extend said generality to nematodes, rather than staking a claim that these new data establish that generality and that this outcome was unexpected. 2. FLP-7/NPR-22: I am confused regarding the identity and function(s) of the peptide FLP-7 and its receptor NPR-22. I had no such confusion upon reading the manuscript, but then out of curiosity I downloaded and read one of the references cited (Palamiuc et al., 2017). Please clarify whether the apparent peptide and receptor discrepancies between your manuscript and those cited below from Palamiuc et al., (2017) are my misunderstanding, or whether they are something that requires additional control experiments. A. FLP-7 is stated unequivocally to be a tachykinin peptide, related to mammalian Substance P and sharing the same C-terminal amino acid sequence, and not a N-terminally extended RFamide peptide as is indicated in this manuscript. Its identification in Palamiuc et al., (2017) as a tachykinin instead of a RFamide peptide is troubling insofar as controls were performed with RFamide peptides, not tachykinins. B. NPR-22 is stated unequivocally to be related to a mammalian tachykinin receptor (NKR). This discrepancy calls into question whether the NPR-22 deletion experiments represent exclusively complementary results to the CeRYamide manipulations or whether they also represent elimination of C. elegans tachykinin actions. In this paper Ohno and colleagues identify and characterise a new C. elegans RYamide neuropeptide. First, they perform biochemical purification and isolate C. elegans ligands for the Drosophila RYamide receptor, CG5811. Following fractionation and MS analysis, the authors identified RYamide peptides that derive from a hitherto undescribed C. elegans proneuropeptide. These RYamide peptides activated the C. elegans NPR-22 receptor, a homolog of Drosophila CG5811. The RYamide ligands were more potent agonists of NPR-22 than the previously identified FLP-7-3, an RFamide peptide. Using available mutants and an impressive set of transgenic strains the authors then analysed in detail the function of CeRYa and NPR-22. They found that CeRYamide-1 and CeRYamide-2 act through NPR-22 to control multiple processes, including egg laying, pharyngeal pumping, and longevity. The authors used transgenic rescue constructs restricted to individual neurons to reconstruct neuron-level RYamide signaling pathways. These are interesting results and demonstrate the power of C. elegans to reconstruct neuropeptide action at a single cell resolution. I have some criticism regarding the phylogenetic analysis and the evolutionary interpretation of the results. First, the phylogenetic tree presented in Figure 1—figure supplement 1 is of insufficient quality. The taxon sampling and number of sequences is very low. The Neighbor Joining method used is not suitable to satisfactorily resolve GPCR phylogeny. Instead, the authors should use ML or Bayesian analysis with a larger number of sequences. I performed a more extended analysis of these receptors. I could confirm that NPR-22 is orthologous to Drosophila CG5811, the RYamide receptor. However, this family is not orthologous to NPY receptors in vertebrates. The RYamide receptor family was previously shown to be related to luqin receptors from annelids and mollusks (PMID: 23637342, 26190115). These constitute a distinct family from NPY receptors, more closely related to leucokinin receptors. Furthermore, analysis of the peptide precursor sequence also identifies Y75B8A.11 as a clear ortholog of luqin (also called abdominal ganglion neuropeptides L5-67) propeptides. These all have one or two RY/RFamide peptides directly after the signal peptide and a C-term domain with two conserved Cys residues. These are also present in Y75B8A.11. Overall, the combined proneuropeptide and receptor evidence clearly shows that the authors studied the C. elegans luqin-luqin receptor system. Luqin is an ancient bilaterian family and homologs can also be found in non-vertebrate deuterostomes (e.g. starfish PMID: 26865025, hemichordates), however, this family has been lost from vertebrates. An overview of luqin function in mollusks can be found in PMID: 25386166. The authors should consider renaming the peptide to luqin, representing the more widely used name for this conserved family. The authors also need to rewrite the discussion and parts of the introduction. Especially, references to NPY signaling are less relevant, and the authors should compare their results to what is known about luqin signaling (not much). e.g., "Our results indicate that RYamide-containing peptides-NPY-like receptor axis is more widely" this is not true, since RYamides in insects are not orthologous to NPY. In the introduction, the authors state that the comparative analyses of peptides across species have been hindered by their small size and low sequence conservation. This is not entirely true, there have been major developments in recent years in the comparative genomics of neuropeptides and their receptors, see: PMID: 23671109, 23637342, 25904544, 28444138, 26865025. Thank you for resubmitting your work entitled "CeRYamides regulate food-evoked responses in C. elegans" for further consideration at eLife. Your revised article has been favorably evaluated by Eve Marder (Senior editor), a Reviewing editor, and two reviewers. The manuscript has been much improved but there are some remaining issues that need to be addressed before acceptance, as outlined below. These are only editorial issues, but they are important. In particular, there was general agreement that the issue of homology assignment was not sufficiently addressed (point #1 including all the subpoints). 1) NPY peptides vs. Luqin peptides: It is essential that the author provide a proper description of evolutionary relationships. a) The C-terminal identity is not a sufficient indicator of a family relationship, but the authors imply that it is. This has to be changed. A C-term RYamide motif can occur in several different, unrelated neuropeptides, including NPY, RYamide/luqin, repetitive FMRFamide, and occasionally in sulfakinine. Furthermore, not all NPY/NPF or luqin peptides end with an RYamide. Deuterostome luqins end with RWamide, and protostome NPFs are RFamides. see Figure S1D. in www.pnas.org/cgi/content/short/1221833110 for more details. Thus, the presence of an RYamide motif alone is not sufficient to establish the orthology of the precursors. It is therefore misleading to refer to a group of unrelated peptides as RYamides, since it does not necessarily mean a close relationship. b) Abstract: "Both peptides are like luqin in invertebrates and contain C-terminal arginine-tyrosine-NH2 (RYamide) structures identical to those of the neuropeptide Y (NPY) family in vertebrates." This needs to be changed. First, it would be good to state that both peptides derive from the same precursor. I suggest the following wording "Both peptides derive from the same precursor that is orthologous to invertebrate luqin/RYamide proneuropeptides." The second part of the sentence should be deleted, since the final two residues cannot be used as an evidence of orthology, but the wording implies a close relationship. c) Last sentence of abstract: "Our results suggest that the roles of some RYamide-containing peptides and peptide-mediated negative feedback are widely conserved in feeding regulation among many animal classes." This needs to be changed. Since the exact relationship of NPY and luqin/RYamide is not clear and would require more extensive phylogenetic analysis, the authors also cannot argue about conservation. There are very few studies on luqins/RYamides, the only one I found is from the same group and shows that "When administered to blowflies, dRYamide-1 suppressed feeding motivation." Finding a function for an unstudied bilaterian neuropeptide family is interesting enough. The closing sentence should best just state what the authors found without overselling "Our results identified a critical role for luqin in feeding regulation..."
e) Introduction: "RYamides, peptides containing the C-terminal RYamide structure first discovered in the brachyuran crab Cancer borealis (Li et al., 2003), form a subgroup of luqins, and are also found in diverse invertebrates, such as crustaceans (Christie, 2014; Dircksen et al., 2011; Ma et al., 2010), mollusks (Proekt et al., 2005; Veenstra, 2010), and insects (Hauser et al., 2010; Ida et al., 2011; Roller et al., 2016)." This is not precise. RYamides do not form a subgroup of luqins, but are luqins that are named RYamides for historical reasons. The orthology of mollusk/annelid luqins and insect RYamides has only recently been recognised. These propeptides form one orthologous group, meaning that they trace back to one ancestral luqin peptide that was present in the common ancestor of all bilaterians. This peptide has been retained in ambulacrarians on the deuterostome side of the bilaterian tree, and lost from chordates. They have been retained in most protostomes. The history of the luqin/RYamide receptors exactly parallels this distribution, showing (as 30 other bilaterian peptide-receptor pairs) the long-term stability of peptide-receptor pairs in evolution. Members of this family should best be called luqin, to avoid confusion. The name RYamide is preferred by the authors, probably because they want to emphasise its similarity to vertebrate NPY, however, this is now known, that luqin/NPY systems are not orthologous. In the text, the authors should also mention that luqin has been identified in S. purpuratus and S. kowalevskii (two deuterosomes), but has been lost from chordates. f) The tree in (Figure 1—figure supplement 1) luqin and RYamide receptors are highlighted in two colours. This is unfortunate, since it is one orthologous family, and that part of the tree only represents the species tree. The two sides of the orthology group (with lophotrochozoans and ecdysozoans on the two sides) should be highlighted in the same colour and referred to as luqin/RYamide receptors. h) Nomenclature: To use Ce in the peptide name is not very fortunate, because the same peptide would then be called CbRY in C. briggsae and so on. This propeptide is a C. elegans luqin, and the receptor is a C. elegans luqin receptor. Furthermore, the propeptide that the authors identified has already been predicted as a C. elegans luqin in the very elegant bioinformatic study of Oliver Mirabeau in 2013 (www.pnas.org/cgi/doi/10.1073/pnas.1219956110). This also shows that the identity of CeRY as a luqin is very clear. See Mirabeau & Joly Dataset S1, alignment #30 www.pnas.org/cgi/doi/10.1073/pnas.1219956110 a quote from their paper: "We give predictions for C. elegans peptides that had not been characterized to date, which include TK, DH31/Calc, SIFa, LK, luqin, and AstA,B,and C (Dataset S1)." i) Results section: "We designated these PALLSRY-NH2 and AVLPRY-NH2 peptides as CeRYamide-1 and CeRYamide-2, respectively. The proneuropeptide has a characteristic of luqins with canonical pair of cysteines in the C-terminal portion (Figure 2B)." The peptides should be referred to as luqin-1 and luqin-2 (or, to accommodate the 4 letter restriction of gene names in C. elegans, luq or luqi). 2. Co-transmitters: In the Authors’ Reply to Reviewer Comments, they indicate that there are identified co-transmitters (including other neuropeptides) in the CeRYamide-containing M1 and M2 neurons but, given the data in this manuscript, the CeRYamide peptides are clearly the most important with respect to the studied behaviors. This may be true, but in fact that conclusion is premature. While we do agree that this conclusion may be correct, unless one actually performs experiments to understand the role(s) of the co-transmitters, it is simply not possible to know whether (a) the CeRYamides are indeed predominant in these behaviors, or (b) the imbalance between the actions of CeRyamides vs. its co-transmitters created by the manipulations in this manuscript provides heightened or diminished actions of one or more co-transmitter that are pivotal to the behavioral changes observed. Without a doubt, the CeRYamides play an important role in the studied behaviors, but considering that role to be pre-eminent seems premature. This point is also further addressed in the next comment (Major Comment #3). A) Insofar as it is suggested in the Discussion section that the two CeRyamide-containing neurons (M1, M2) may have distinct functions, it seems relevant to include in that discussion the identity of the co-transmitters in those neurons since they may well contribute to the distinct functions. 3. Whole animal manipulations vs. individual neuron functions (Discussion section): The fact that the two CeRYamide-containing neurons (M1, M2) "may have opposite functions in feeding" gives one pause with respect to how reliably the experiments performed in this paper mimic the natural functions of neuronally-released CeRYamides. By way of example from a different model system, physiological studies in the crustacean stomatogastric ganglion have shown that directly applying an identified peptide (proctolin) to this ganglion does not mimic the actions of 2 of the 3 types of proctolin-containing neurons that innervate this ganglion (reviewed in: Nusbaum et al., 2001; 2017). Whole system manipulations of a neuropeptide, as performed in the current manuscript, provide considerable valuable information regarding the action(s) of the manipulated peptide (as do the results in this paper), but those actions should never be considered to be identical to those of the peptide when they are neuronally released, unless this relationship is established by experiments. There are numerous reasons for the likelihood of discrepancies between these two approaches (e.g. see Nusbaum et al., 2017), one of which is the aforementioned (comment #3) presence of co-transmitters. Therefore, it is prudent to provide in the Discussion section an explicit indication that future studies will determine the extent to which the behavioral consequences established in this paper reflect the actions of neuronally-released CeRYamide. […] The identification of loss of function phenotypes for the peptide and receptor genes is a key issue in evaluating this paper. It is a general problem that loss of function mutant phenotypes for neuropeptides and their receptors are very difficult to identify. It appears that a typical neuropeptide is released and has effects only under very particular conditions and then has very specific effects, so finding these is like hunting for a needle in a haystack. The authors use a clever and potentially generalizable approach to solve this problem. They first identify the specific cells that express the peptide and receptor, and use the detailed existing knowledge of worm neural functions to be able to guess possible functions to test. They next find phenotypic effects of overexpressing or injecting the peptides. They then try varying the conditions in which they culture the worms (feeding and starving) to eventually find related phenotypic defects in the loss of function mutants. The paper could be criticized in that the loss of function effects seen are quite subtle, and certainly it would be nice if they were stronger. However, the current state of the field is such that it is impressive to see any loss of function effects for neuropeptide or neuropeptide receptor loss of function mutants. We sincerely appreciate the thoughtful comments and evaluation by the reviewer. As the reviewer pointed out, we wished that the loss-of-function phenotypes were stronger, but the defect was towards the direction opposite to the overexpression phenotype, and manifested under particular conditions. This is exactly how we reasoned and found the phenotype. We are grateful to the reviewer for evaluating the overall significance of the work. 1) Impact statement/Elsewhere - "unexpected parallels between the feeding regulatory mechanisms in C. elegans, arthropods, and mammals mediated by neuropeptides with common C-terminal RYamide motifs." At various locations in the manuscript (e.g. Abstract, Impact Statement, end of Introduction, Discussion), of which the partial quote from the Impact Statement is one example, the impact of the results are used to establish the generality of this peptide family with respect to feeding-related behaviors across animal classes. However, this "generality" was already evident. As indicated in the text (e.g. Introduction and elsewhere), what this paper does (and does very nicely!) is to extend to C. elegans the results of many previous studies in a number of other, disparate animal groups (e.g. molluscs, insects, crustaceans, mammals). It seems more appropriate to indicate that these new data extend said generality to nematodes, rather than staking a claim that these new data establish that generality and that this outcome was unexpected. In Impact Statement, we deleted "unexpected", leaving the following statement: "CeRYamide peptides reveal parallels between the feeding regulatory mechanisms in C. elegans and those in arthropods and mammals". In Introduction, we deleted "unexpected" and rephrased the sentence, leaving the following statement: "Here, we demonstrate that the RYamide-containing peptides are conserved in C. elegans […]". As pointed out by the reviewer, Palamiuc et al., claimed that FLP-7 is a ligand of NPR-22 based on the previous cell-line assay (Mertens et al., 2006, Peptides). This is consistent with our assay and our results show that CeRYamides are more potent agonists of NPR-22 (Figures 2E and 2F). Palamiuc et al., also showed that loss-of-function mutants of flp-7 and npr-22 show a similar defect in fat reduction in the presence of serotonin, consistent with the possibility that FLP-7 acts on NPR-22 in vivo. This is not inconsistent with our result that CeRYamides are ligands for NPR-22, and it is possible that both of these different peptides act on NPR-22. We added discussion on this possibility in the text. As discussed by Reviewer #3, their assignment of FLP-7 to tachykinin and NPR-22 to tachykinin receptor is not based on strong evidence. In Palamiuc et al., (2017), the sequences of FLP-7-1 and Substance P were shown as SPMQRSSMVRFGKR and RPKPQQFFGLMGKR, respectively (Supplementary Figure 1B). However, the last two basic amino acid residues (KR) are the putative cleavage site in the precursors and the third residue from the last (Glycine) serves as the putative amide donor for C-terminal amidation. Thus, the last three residues (GKR) are a fairly common motif in peptide precursors and FLP-7 peptides are highly likely to be RFamides. Considering this, in our opinion, the similarity in the sequences of mature FLP-7-1 and substance P, SPMQRSSMVRFamide and RPKPQQFFGLMamide, are quite limited. […] I have some criticism regarding the phylogenetic analysis and the evolutionary interpretation of the results. First, the phylogenetic tree presented in Figure 1—figure supplement 1 is of insufficient quality. The taxon sampling and number of sequences is very low. The Neighbor Joining method used is not suitable to satisfactorily resolve GPCR phylogeny. Instead, the authors should use ML or Bayesian analysis with a larger number of sequences. We thank the reviewer for raising this important issue. As suggested, we also performed phylogenetic analysis of the receptor with increased number of receptors from various organisms. As already shown by the reviewer, NPR-22 belongs to the Luqin receptor/RYamide receptor group, which is distantly related to NPY receptor family and tachykinin receptor family. Figure 1—figure supplement 1 was replaced with this revised version. Also, throughout the text we indicated that NPR-22 belongs to the luqin/RYamide receptor family. The authors should consider renaming the peptide to luqin, representing the more widely used name for this conserved family. The authors also need to rewrite the discussion and parts of the introduction. Especially, references to NPY signaling are less relevant, and the authors should compare their results to what is known about luqin signaling (not much). We thank also for leading us to these literature. Based on the alignments made in previous studies, RYamides form a subgroup of the luqin family, so we keep the nomenclature CeRYamide but clearly indicated in the revised manuscript that the precursor is like members of the luqin family. E.g., "Our results indicate that RYamide-containing peptides-NPY-like receptor axis is more widely" this is not true, since RYamides in insects are not orthologous to NPY. We corrected such sentences because of the distant relationship of CeRYamide and its receptor to NPY. The "NPY-like" was omitted from the title. 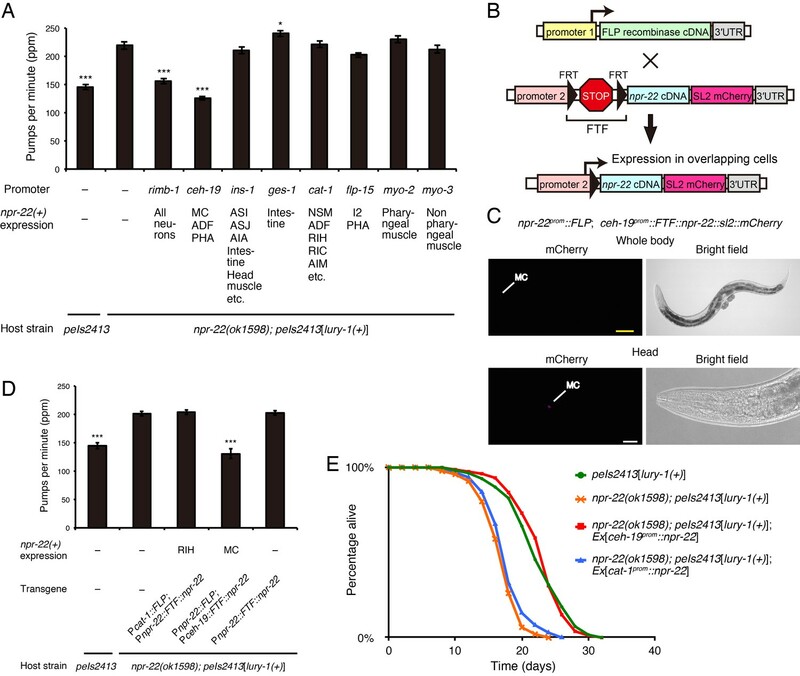 "axis of RYamide-containing peptides and NPY-like receptor is unexpectedly conserved in C. elegans" was changed to "RYamide-containing peptides are conserved in C. elegans". "Our results indicate that RYamide-containing peptides–NPY-like receptor axis is more widely conserved among animal classes than previously thought" was deleted. Although with the distant relationship, we consider introduction of NPY family is beneficial because peptidergic control of feeding-related functions is a general scheme. So the introduction now refers to all relevant information including NPY and luqin. Thank you again for the guidance. We cited these references. a) The C-terminal identity is not a sufficient indicator of a family relationship, but the authors imply that it is. This has to be changed. A C-term RYamide motif can occur in several different, unrelated neuropeptides, including NPY, RYamide/luqin, repetitive FMRFamide, and occasionally in sulfakinine. Furthermore, not all NPY/NPF or luqin peptides end with an RYamide. Deuterostome luqins end with RWamide, and protostome NPFs are RFamides. see Figure S1D. in www.pnas.org/cgi/content/short/1221833110 for more details. As the reviewer suggested, we revised Introduction and Discussion, and removed indeliberate reference to all RYamide-containing peptides as “RYamides”. For example, we changed the phrase “RYamides, peptides containing the C-terminal RYamide structure first discovered in the brachyuran crab Cancer borealis (Li et al., 2003),” to “In invertebrates, peptides containing the C-terminal RYamide structure were first discovered in the brachyuran crab Cancer borealis (Li et al., 2003)”. The term "RYamides" is only used for putative luqin orthologues based on the related structures of the propeptides in the revised manuscript, as described further below. b) Abstract: "Both peptides are like luqin in invertebrates and contain C-terminal arginine-tyrosine-NH2 (RYamide) structures identical to those of the neuropeptide Y (NPY) family in vertebrates." This needs to be changed. First, it would be good to state that both peptides derive from the same precursor. I suggest the following wording "Both peptides derive from the same precursor that is orthologous to invertebrate luqin/RYamide proneuropeptides." The second part of the sentence should be deleted, since the final two residues cannot be used as an evidence of orthology, but the wording implies a close relationship. c) Last sentence of abstract: "Our results suggest that the roles of some RYamide-containing peptides and peptide-mediated negative feedback are widely conserved in feeding regulation among many animal classes." This needs to be changed. Since the exact relationship of NPY and luqin/RYamide is not clear and would require more extensive phylogenetic analysis, the authors also cannot argue about conservation. There are very few studies on luqins/RYamides, the only one I found is from the same group and shows that "When administered to blowflies, dRYamide-1 suppressed feeding motivation." Finding a function for an unstudied bilaterian neuropeptide family is interesting enough. The closing sentence should best just state what the authors found without overselling "Our results identified a critical role for luqin in feeding regulation"
We omitted reference to NPY and changed the sentence to “Our results identified a critical role for luqin-like RYamides in feeding-related processes and suggested that peptide-mediated negative feedback is important for satiety regulation in C. elegans”, to avoid any mention about conservation among species. Many ecdysozoan peptides have been called “RYamide” in previous studies. Mirabeau and Joly (2013) also used the expression “alignment of lophotrochozoan luqin and arthropod RYamide peptides” (Dataset S1, #30). The presence of the paired-cysteine motif is apparently not a perfect hallmark of the luqin/RYamide family. The original dataset of Mirabeau and Joly (2013) includes 13 members of the luqin/RYamide (http://neuroevo.org), but out of them three members (jgi_213930_Ctel, gi_18866372_Agam, and Ensembl_FBtr0310523_NepY_Dmel) were not presented in the alignment in their paper (Dataset S1, #30). Of these, jgi_213930_Ctel and Ensembl_FBtr0310523_NepY_Dmel do not have the paired-cysteine motif in the C-terminal portion. (And gi_18866372_Agam has a long signal peptide.) In addition, the conserved amino acids (S/T)-G and (V/I/L)-(P/Y) between two cysteines are not present in C. elegans. Although there are exceptions, lophotrochozoan luqins and ecdysozoan RYamides have their own characteristics: (a) One peptide is produced from a lophotrochozoan luqin precursor, but two peptides are produced from an ecdysozoan RYamide precursor and (b) The C-terminal structure of most ecdysozoan RYamide peptides is RYamide. We surely think that lophotrochozoan luqins and ecdysozoan RYamides evolved from a common ancestor as the reviewers pointed out, but the C. elegans peptides apparently have RYamide-like features. it is currently unclear whether lophotrochozoan luqins and ecdysozoan RYamides are functionally relevant, because the physiological functions of these peptides, especially of luqins, have been largely unexplored. We refined the phylogenetic tree (Figure 1—figure supplement 1) as suggested. We discussed the gene name with the WormBase staff and assigned Y75B8A.11 the gene name lury-1 (LUqin-like RYamide peptides or LUqin/RYamide peptides). According to the new gene name and the C. elegans peptide nomenclature (Li and Kim, 2008, Wormbook), we changed the peptide names “CeRYamide-1 and -2” to “LURY-1-1 and -2”. As noted above, we named the gene lury-1 and changed the peptide names accordingly. 2) Co-transmitters: In the Authors’ Reply to Reviewer Comments, they indicate that there are identified co-transmitters (including other neuropeptides) in the CeRYamide-containing M1 and M2 neurons but, given the data in this manuscript, the CeRYamide peptides are clearly the most important with respect to the studied behaviors. This may be true, but in fact that conclusion is premature. While we do agree that this conclusion may be correct, unless one actually performs experiments to understand the role(s) of the co-transmitters, it is simply not possible to know whether (a) the CeRYamides are indeed predominant in these behaviors, or (b) the imbalance between the actions of CeRyamides vs. its co-transmitters created by the manipulations in this manuscript provides heightened or diminished actions of one or more co-transmitter that are pivotal to the behavioral changes observed. Without a doubt, the CeRYamides play an important role in the studied behaviors, but considering that role to be pre-eminent seems premature. This point is also further addressed in the next comment (Major Comment #3). It is surely possible that the multi-copy expression and/or the deletion of the peptides affect the functions of the co-transmitters, although we do not think that the synthetic peptides administered into the worm body (Figure 5) act specifically on a co-transmitter(s) expressed in M1 and M2. We added statements about the co-transmitters in Discussion (see below). (A) Insofar as it is suggested in the Discussion section that the two CeRyamide-containing neurons (M1, M2) may have distinct functions, it seems relevant to include in that discussion the identity of the co-transmitters in those neurons since they may well contribute to the distinct functions. We thank the Caenorhabditis Genetics Center and Mark Alkema for strains; Eri Iwamoto and Yoshiki Nakashima for technical assistance; Noboru Murakami, Pavak Shah, and members of the Ida and Iino laboratories for helpful comments and advice. © 2017, Ohno et al.